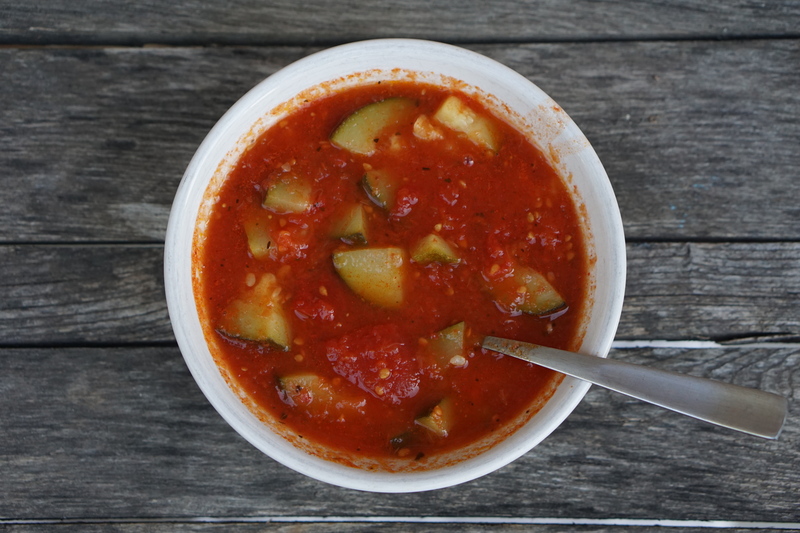 Hearty Tomato Zucchini Soup is a perfect meal for an autumn harvest. Made from the garden’s bounty, this recipe is made up of harvested tomatoes, onions, zucchini, garlic, basil, and thyme. The soup is fresh, flavorful, and feast for the eyes to look at with its deep red and green ingredients. The garlic cloves I used in this recipe were from Sunnyfield Farm, a local garlic and sheep farm in Eden, Utah. Support of local farmers and growers is good for community economics and local commerce. SunnyField Farm Garlic is of the highest quality and free from chemicals and pesticides. You can use coupon code brehealthy25 to get 25% off their garlic. You can buy garlic from their Sunnyfield Farm Shop. On the more than a half-acre lot that my family lives on, you’ll find a big garden plot, horseback riding area, garage shop, barn, grassed yard, and a cozy farm home. In addition to our land, we have a lease on the several acres behind our property. On our pasture, we raise horses. We personally own three equines, a bay horse, Palomino horse, and one pony. The pony is a mix between a Shetland pony mare and Morgan stud. I think horses are such beautiful animals. I enjoy their company at our home and enjoy the care and keeping of our equines. My husband is naturally gifted in horsemanship and I love learning from him! We raised a Charolais cross beef steer for meat a couple years ago. I loved having our own pasture-raised meat in our chest freezer. Cattle are beautiful animals and I appreciated the provision of meat the steer provided us. Within the next couple of years, I would like to try my hand at raising chickens. However, my barn needs cleaning and de-cluttering first. I want a very clean, sanitary, and organized environment for my young children and livestock to be in. And no, my children do not live in my barn, just play in there! ha ha. Clean healthy chickens make clean healthful eggs. Clean healthful eggs will go into our clean healthful human bodies. The health of our food chain matters! In our garden plot this 2018 year, we grew: zucchini, corn, tomatoes, spaghetti squash, and cantaloupe. The planting season was right in the middle of our move into our new home, so we planted our garden late. For watering, we used an overhead sprinkler. Therefore, our garden produced plants well, but so did the weeds. The large garden’s weeds got too much for me and I fell behind on the weeding. There were many mistakes on my behalf with the garden, however, gardening is a personal journey of trial and error and finding what works for your garden and lifestyle. Now I know more about how I want to plant my garden next year. Next year, I will plant only one zucchini plant, half the amount of tomatoes, two cantaloupe plants, two spaghetti squash plants, and add in butternut and acorn squash into the mix. With the large number of tomatoes and zucchini we grew, I wanted to create a recipe that I could use up the tomatoes and zucchini with. With that, the Hearty Tomato Zucchini Soup was created! In addition to the tomato zucchini soup, my zucchini egg waffle recipe is another tasty recipe I enjoy this time of year! Chop zucchini and mince garlic. Sauté zucchini in olive oil in a frying pan. Once the zucchini is tender, add garlic and continue to sauté until garlic is aromatic. Once finished, remove from heat and do to next step in the recipe. In a blender, blend the onion and tomatoes. Pour purée in a big soup pot. If you want a chunky tomato soup, leave one quart or can of tomatoes unblended. Add sautéed zucchini and garlic to the soup pot. Add spices and seasoning to the soup, including chicken bouillon, salt, pepper, thyme, and basil. Simmer soup for 10 minutes. Remove from heat and let each serving cool down in a bowl. Enjoy! To spice up the meal, you can sprinkle cheese on the soup and/or add grilled chicken chunks. It is also great served with grilled cheese sandwiches!